I heard that rumour about only the original line-up being called Sabbath too, but the three new songs they did with Dio and Appice for Black Sabbath – The Dio Years were released as Black Sabbath, not Heaven & Hell. 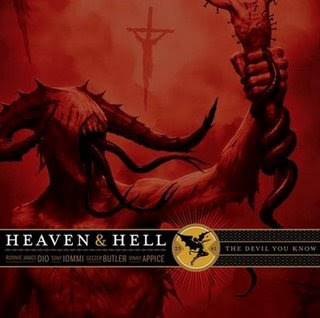 "There was a lot of speculation that this band was now being called HEAVEN AND HELL and not BLACK SABBATH because of something to do with legalities or Sharon Osbourne or whatever the case may be. That is NOT the case. Tony Iommi owns the name BLACK SABBATH, and he and Ronnie James Dio decided that it would be best to call this lineup something else because they felt that after SABBATH with Ozzy went into the Rock and Roll Hall of Fame, it would probably be a little bit disrespectful and a little bit confusing to that name and that band that's in the Rock and Roll Hall of Fame to call their reunion with Dio BLACK SABBATH again. So they decided — it was strictly up to them; it was their decision internally — to instead call it something else. That's why the live shows are being billed as HEAVEN AND HELL. But it is a little bit confusing because the record that is gonna come out is gonna be called 'Black Sabbath: The Dio Years' [to be issued via Rhino Records]." ahh okay that seems pretty definitive.. anyway whatever the band’s called, it’s a cracker of an album!